"Part of what I'm interested in is whether or not value strategies really are 'value' strategies. Some of them seem to work more like short-term mean reversion strategies that may be really lousy over the long-haul." My hunch is that somrh is right: many statistically cheap stocks are cheap because there's some structural handicap that depresses their ROIC, and this dooms them to low long-term returns regardless of valuation. A lot of academic studies claim that statistically cheap stocks outperform the market, but they typically look performance over a single year. The ones that look at performance over longer periods typically re-balance annually. Rather than measuring outperformance, these studies may be measuring cheap stocks' ability to stage a dead cat bounce. A group of statisticians has analyzed Warren Buffett's investing returns. By looking at Berkshire Hathaway's 13F filings, they estimate that Buffett's public stock investments have outperformed the market by a much narrower margin than Berkshire's growth in book value. They conclude that Buffett has enhanced his returns with cheap leverage, calculating that the effective interest rate on Berkshire's insurance float has historically been less than the T-bill rate. "In summary, we find that Buffett has developed a unique access to leverage that he has invested in safe, high-quality, cheap stocks and that these key characteristics can largely explain his impressive performance." Nonetheless, it makes a compelling argument that Buffett's has increased his returns with a uncommon form of leverage. This goes against the typical narrative of Buffett's success. For instance, in the introduction to Buffett: The Making of an American Capitalist, Roger Lowenstein writes that "Most of what Buffett did was imitable by the average person" and "As an investor, Buffett eschewed the use of leverage." Most of what Buffett does may or may not be imitable, but the one thing that sets him apart from other skilled investors-- the cheap leverage-- definitely isn't. Without talented insurance executives to underwrite well, the cost of Berkshire's float would not have been so low. Without Ajit Jain and his predecessors, Buffett would not be Buffett. Prem Watsa at Fairfax Financial tried to copy Buffett's strategy of investing insurance float, and Fairfax nearly blew up even though Watsa's returns have been comparable to Buffett's. Contrary to the perception that Buffett is the greatest investor alive, his unlevered returns are good but no higher than those of many other people. It's his business model that's exceptional. Investors should keep that in mind whenever Buffett opines about valuations, the economy, or the likely level of future stock-market returns. His opinions about these things aren't what made him uniquely rich, so they aren't uniquely valuable. Ever since Grant's Interest Rate Observer criticized Valeant Pharmaceuticals (VRX) a couple months ago, the company has attracted a lot skepticism about its business model. Grant's and the other critics imply that VRX is a Ponzi analogue: it makes lots of acquisitions and slashes R&D, which boosts near-term earnings at the expense of the company's long-term health. To mask the deterioration of its previous acquisitions, VRX has to keep making new acquisitions and play a lot of accounting games. Another, less-publicized problem is that VRX is highly leveraged and its business model relies on cheap debt to earn adequate returns. The company has $17bn of debt (and tangible book value of -$17bn) compared to quarterly revenue below $2bn. The yield on its outstanding debt is in the 6-7% range. The financing VRX has arranged for its Allergan takeover is expected to yield even less, about 5.5%. VRX isn't cheap-- it trades at ~8x EV/sales-- so if it has to pay down its debt or refinance it at higher rates, the stock will crater. VRX's investors are making an implicit bet on a perpetual credit bubble. I think VRX is a sham and its business model is a total joke, but a lot of other people have already written about the company's flaws, so I won't dwell on them. I think it's more interesting to discuss why so many well-respected investors have bought into the Valeant story. There seem to be two reasons why VRX is popular. The first is that large pharmaceutical companies tend to waste a lot of money on research and development. At least that's a common perception among investors. VRX's strategy of slashing R&D to the bone capitalizes on investors' dissatisfaction with the pharmaceutical industry's usual way of doing business. The second is the idea that VRX's president, Michael Pearson, is a great capital allocator in the mold of Henry Singleton, John Malone, and other people profiled in William Thorndike's The Outsiders. VRX's presentations encourage this kind of comparison, touting its commitment to "superior capital allocation" and running a decentralized company. Bill Ackman, who's teamed up with VRX in its hostile takeover of Allergan, takes this a step further with a presentation that explicitly compares VRX and Pearson to Thorndike's outsiders. I was critical of The Outsiders because the book has methodological problems and the people it profiles derived a lot of their success from aggressively using leverage. But whatever their flaws, I think the strategy VRX/Pearson uses is far worse. There's a phenomenon in nature called Batesian mimicry. Wikipedia defines it as "a form of mimicry typified by a situation where a harmless species has evolved to imitate the warning signals of a harmful species directed at a common predator." In other words, a harmless species develops superficial features that make it look like a more dangerous species. The dangerous species has spent a lot of energy developing and maintaining the qualities that make it dangerous to predators, and Batesian mimicry lets the harmless species free-ride off that. Eric Falkenstein has applied the concept of Batesian mimicry to finance, arguing that a similar process fuels business cycles and bubbles. His idea-- I'm grossly oversimplifying here-- is that when an industry produces high returns, investors look for ways to invest in that industry. To simplify the process of finding good companies to invest in, they emphasize superficial qualities that have historically indicated strong future performance. This creates an opening for lower-quality companies to mimic these characteristics, free riding on the strong returns of earlier, higher-quality companies. Falkenstein offers the dotcom bubble as one example of this. In the late 1990s, several internet companies that pursued large market opportunities were willing to lose a lot of money to gain market share. This strategy was successful, and their stock prices surged. Investors responded by throwing money at a lot of other internet businesses that had big dreams and lost money. Most of these companies were low-quality mimics: eToys, Webvan, etc. Falkenstain casts Batesian mimicry as a process specific to asset clases. Investors, drawn to the strong historical returns of railroad bonds, or commercial real estate, or dotcom stocks, or housing, chase progressively lower-quality investments (i.e., mimics) in the same asset class. I'd take it further and argue that Batesian mimicry isn't limited by asset classes. It can also occur with regard to capital-allocation strategies irrespective of asset class. And that is essentially what Valeant is: it's a Batesian mimic of the people profiled in The Outsiders. VRX copies the superficial aspects of successful capital allocators, but its really a debt-fueled roll-up with bad accounting. • The outsider CEOs were fanatical about cutting expenses, but the expenses they cut were things like glitzy headquarters that contributed nothing to future profits. The outsiders' cost-cutting was essentially about resolving the agency-principal problem. VRX cuts expenses that, although they may be made in an undisciplined fashion, contribute to future profits. The outsiders cut fat, VRX cuts muscle. • Many successful capital allocators emphasize cash flow rather than reported earnings because reported earnings can understate a business's true earnings power, so VRX reports "adjusted earnings" to bridge the gap between the two. But VRX also reports "adjusted cash flow," which is a travesty of the logic behind adjusted earnings. • VRX paid a mid-teens EBITDA multiple for Bausch & Lomb. It got into bidding wars for two of its smaller acquisitions. It got into a bidding war with itself for Allergan. This isn't the behavior of a great capital allocator. • VRX's adjusted earnings exclude amortization of finite-life intangibles. This kind of amortization isn't a cash cost, but it's a very real economic cost, so VRX's "adjusted earnings" distort economic reality. There's a big difference between e.g. Capital Cities amortizing a broadcasting license and VRX amortizing a drug it's acquired that will go off patent in two years. • The outsiders who did roll-ups did so to achieve a scale advantage, e.g. John Malone and his cable systems. VRX's scale advantages are minimal by comparison. VRX cuts R&D down to 2-3% of revenue. Bulls say that more R&D isn't necessary because much of VRX's business is generic drugs and over-the-counter products rather than patented drugs. This defies common sense. Teva spends ~7% of revenue on R&D and hasn't grown much, so most of its R&D is likely needed to stay in place. Even consumer products require R&D: new delivery mechanisms, new product formulations, new branding, whatever. Many people say that Pearson is impressive in his presentations and public statements. I care a lot less about how articulate a CEO is than how much integrity he has, and VRX's effort to acquire Allergan raises serious questions about that. Pearson partnered with Ackman in a way that let him reap insider-trading profits. What Ackman did was technically legal, but it was still grossly unethical, and Pearson's willingness to partner with him suggests bad judgment at a minimum. Eight times revenue is a terrible price to pay for a company with minimal (arguably, negative) organic growth. In nature, Batesian mimics are sheep in wolves' clothing. In Falkenstein's analogy, they're the opposite. I think VRX is a class wolf in sheep's clothing: beneath the appearance of a successful capital-allocation strategy, it has a fundamentally flawed, Ponzi-style business model. Five years from now I expect people to be asking, "How could anyone have thought this was sustainable? How could so many smart investors have been fooled?" • Government involvement in healthcare, including Obamacare, has been remarkably favorable for the private sector. Most regulations have increased demand for healthcare without cutting down on the healthcare industry's profits, at least not comprehensively. There's no guarantee that future regulations will be so benign, and I would argue that the regulatory environment can only get worse from here. If you think about it, there isn’t very much money to be made off a vaccine because a person uses it once or twice in his or her life and that’s it. Instead, think of the amount of money to be made off a statin when a person is going to take it every day of their life. There’s just not much motive for drug companies to invest in products that are cures or very good preventatives." • Many people who invest in biotech stocks expect genomics research to revolutionize the treatment of diseases. I think this is wildly over-hyped. Our genes didn't evolve to hurt us. We hear a lot about genetic mutations causing breast cancer, but only 5-10% of breast cancer has a genetic basis. The role that genes play in other diseases is likely even smaller. The New Yorker has a article criticizing Clayton Christensen and his theory of disruptive innovation. It's snarkily written and the author has an axe to grind: in some parts, it's less a critique of Christensen than a moral indictment of Silicon Valley, with the author writing that "innovation is the idea of progress jammed into a criticism-proof jack-in-the-box." In his account of the mechanical-excavator industry, Christensen argues that established companies that built cable-operated excavators were slow to recognize the importance of the hydraulic excavator, which was developed in the late nineteen-forties. “Almost the entire population of mechanical shovel manufacturers was wiped out by a disruptive technology—hydraulics—that the leaders’ customers and their economic structure had caused them initially to ignore,” he argues. Christensen counts thirty established companies in the nineteen-fifties and says that, by the nineteen-seventies, only four had survived the entrance into the industry of thirteen disruptive newcomers, including Caterpillar, O. & K., Demag, and Hitachi. But, in fact, many of Christensen’s “new entrants” had been making cable-operated shovels for years. O. & K., founded in 1876, had been making them since 1908; Demag had been building excavators since 1925, when it bought a company that built steam shovels; Hitachi, founded in 1910, sold cable-operated shovels before the Second World War. Manufacturers that were genuinely new to excavation equipment tended to sell a lot of hydraulic excavators, if they had a strong distribution network, and then not do so well. And some established companies disrupted by hydraulics didn’t do half as badly as Christensen suggests. I read The Innovator's Dilemma a few years ago and thought it was very interesting, but I took its accuracy for granted. Now I have no idea. Some people have criticized Christensen for applying his theory to various markets where it doesn't fit-- medicine, education, consumer products-- but this is the first wholesale rejection that I've read. In my review of The Everything Store, I said that Barnes and Noble's failed entry into online retailing sounded like an illustration of Christensen's theories. But maybe the reasons for B&N's failure were more complex, and the book only portrays it as an inability to harness disruptive innovation because that's what the dominant theory predicts. The article has made me question a lot of assumptions. It will be interesting to see what kind of responses it gets. One popular idea in behavioral economics argues that the society we inhabit today is radically different from the simpler society our ancestors inhabited and that our environment has changed far more than our minds. We evolved most of our mental shortcuts for the ancestral environment, and while those shortcuts worked well in the past, today they cause us to make a variety of cognitive errors. Bruce Charlton, a medical professor from Britain, argues that the opposite is true, at least for smart people. He claims that humans have two distinct ways of thinking: a set of instinctive behaviors to deal with the problems our ancestors regularly faced, and abstract intelligence to deal with novel problems. He further claims that smart people over-use abstract thinking as a way of solving problems, even when more instinctive, common-sense forms of problem-solving would work better. [A]n increasing relative level of IQ brings with it a tendency differentially to over-use general intelligence in problem-solving, and to over-ride those instinctive and spontaneous forms of evolved behaviour which could be termed common sense. Preferential use of abstract analysis is often useful when dealing with the many evolutionary novelties to be found in modernizing societies; but is not usually useful for dealing with social and psychological problems for which humans have evolved ‘domain-specific’ adaptive behaviours. Charlton has coined the term "clever sillies" to describe intelligent people who overuse abstract intelligence to the detriment of common sense. I find his idea very interesting. I'm sure the behavioral economists are right that many of our instincts have become maladaptive, but there definitely are smart people who let the pendulum swing in the other direction and think in an overly abstract way. To some extent, they're just putting a premium on what they do well. If your common sense is no better than anyone else's but you're great at interpreting abstract patterns, why wouldn't you default to the latter? • The fact that VIC write-ups describing complex or unique investments tend to get better ratings than the ones describing simpler, more straightforward investments. ...I'm sure there are many more. Investors should remember that their scorecard is not computed using Olympic-diving methods: Degree-of-difficulty doesn't count. If you are right about a business whose value is largely dependent on a single key factor that is both easy to understand and enduring, the payoff is the same as if you had correctly analysed an investment alternative characterized by many constantly shifting and complex variables. This isn't a real book review because I stopped reading after 100 pages. What put me off is that The Everything Store only describes what happened inside Amazon, with little description of its competitors or the broader industry dynamics. It would have been much more interesting to read a book that tracks Amazon and several similar companies together during the 90s and describes how Amazon was different from (and similar to) its less successful competitors. As it is, the book doesn't give much context for Amazon's meteoric rise. Nonetheless, here are a few tentative conclusions from what I read. Amazon's early success seems to have been a result of a few big decisions by Bezos. He realized that having a first-mover advantage was essential and was willing to lose lots of money to grow quickly. Then, in late 1999, he realized that financing conditions were getting worse and raised money in a convertible-bond offering before the market imploded. Amazon's early foray into auctions was a failure, but he refused to shut it down and eventually auctions morphed into Amazon Marketplace. Barnes and Noble's effort to create an online bookstore fell prey to the innovator's dilemma. B&N's distribution system was designed to handle large orders by bookstores, not small orders by individual customers, so it wasn't optimal for e-commerce. B&N also didn't want to commit tons of resources to something that would undermine its profitable brick-and-mortar stores. Bezos made his share of bad decisions early on, like investing in Kozmo and eToys. Many of Amazon's expansion efforts failed. The book goes against the widespread perception that Amazon is an unstoppable business predator. My opinion: Amazon's strategy of losing money to gain market share was very successful in its earliest product categories, and this has trained people to ignore the company's continuing losses and see them as farsighted investments in future market share. But I'd wager that this strategy works much better for some product categories than others and that Amazon has already picked the low-hanging fruit. I don't expect Amazon to totally dominate e-commerce. It's human nature to extrapolate the recent past forward. When the stock market has experienced big gains for several years in a row, many people assume-- often subconsciously-- that that's the norm and expect the future to be similar. There’s a point where you’ve raised prices aggressively because you have a great market position. There’s only a finite amount of time you can do that because eventually you’re going to run up against the value that you’re giving to your customers. No matter how great your market position is, your product or service has a finite value. Sometimes if you look at a history of large price increases, I think the normal reaction is to say, “Wow, what a great business. They’ve raised prices at 5% for the past 20 years every single year. It’s great.” But the way I think about that is they’ve very aggressively been using up whatever finite amount of pricing power they have and I’m worried that it’s ending. What’s interesting is that when you look at the history, what you’re not looking for is price increases. What you’re looking for is actually lack of price increases, and that’s what really gives you the very powerful pricing power potential in the future. Avangardco is a Ukrainian egg producer. It trades at a low multiple of reported earnings, and that's attracted a lot of attention from value bloggers-- see here, here, here, and here. These blogs all acknowledge that Avangardco has risks, such as insider control of the company and the political situation in Ukraine, but none mentions what I consider the biggest risk: that the company is a fraud. "Russian VTB Bank's Ukraine subsidiary went public over the summer with complaints that LSE-listed egg producer Avangard was trying to wriggle out of a total $27m debt held by a number of subsidiaries. Avangard is owned by Oleg Bakhmatyuk, former deputy chairman of gas monopolist Naftogaz. 'VTB Bank is considering appealing to the London Stock Exchange and the British Financial Services Authority to exclude the shares of Avangard from the listing, as a company violating the principles of civilized conduct of business,' the company threatened June 22. But VTB now says it has refrained from appealing to the LSE after Bakhmatyuk returned to the negotiating table. Bakhmatyuk disputes the debts." 1. Avangardo tried to defraud its lenders by tunneling assets out of its borrowing subsidiaries. 2. Avangardco had trouble paying its debts, and its IPO was motivated by financial necessity, implying that its reported profits are inflated. I lean toward 2. because I don't think Avangardco's financial statements are believable. The company reported an 46% EBITDA margin last year while Cal-Maine, America's largest egg producer, reported a ~10% margin. Cal-Maine has never achieved an EBITDA margin above 30%. Avangardco also has a weird management structure: Bakhmatyuk, who owns 77.5% of the company, isn't CEO or even chairman. Instead, he's a director, his sister is chairman, and the CEO is a young woman who has no job experience outside of Avangardco. She joined the company out of grad school, became CFO after working there for two years, and became CEO a few years after that. In my experience, weird business or management arrangements are a sign of fraud even when it's not clear how they abet fraud. Avangardco reminds me of ACLN, where the CFO was a 25-year-old who drew no salary from the company and there was a bizarre stock-ownership arrangement between the CEO and the chairman. Even if Avangardco isn't a fraud, VTB's claims and Bakhmatyuk's investments in the US raise serious questions about his integrity. This is not someone I'd ever want to do business with, no matter how seductively cheap the stock looks. Fooling Some of the People All of the Time is David Einhorn's account of his years-long campaign against Allied Capital. In May 2002, Einhorn publicly recommended Allied as a short-sale candidate, arguing that the company wasn't taking necessary write-downs on its loan book. Later on, he discovered widespread fraud at one of Allied's subsidiaries. For years after his 2002 speech, Einhorn tried to get regulators to crack down on Allied, with almost no success. In the introduction to Fooling, Einhorn describes the book as a cautionary tale about a fraudulent company and ineffectual regulators. Reading between the lines, it's also a cautionary tale about Einhorn's stubbornness in sticking with a losing investment. Although his criticisms of Allied were largely valid, Einhorn lost money on Allied for years, and even after the company collapsed in 2008 his annualized return from shorting the stock was quite low. Allied Capital is a business development company (BDC). BDCs invest in small and mid-sized companies, and for tax purposes they are pass-through entities, which mean they don't pay any taxes themselves-- instead, BDCs distribute their income and capital gains to shareholders, and the shareholders pay the taxes. In the late 1990s, Einhorn successfully shorted a BDC called Sirrom. He calculated that 40% of Sirrom's loans ultimately defaulted. There was a lag between when a loan was issued and when it went bad, however, and in the meantime Sirrom was constantly raising new capital, which made the losses look artificially small as a percentage of its assets. Sirrom was a "legal Ponzi"-- it needed to grow constantly, much like a Ponzi scheme needs to grow constantly, to mask the terrible quailty of its loans. In 1998, ripple effects from the crisis at Long Term Capital Management made it difficult for a wide range of companies, including BDCs, to raise money. Sirrom could no longer keep the Ponzi dynamic going, and its stock price collapsed. When Einhorn first learned about Allied several years later, he thought it was very similar to Sirrom. Allied, too, had elements of a legal Ponzi-- it was constantly raising money to expand its loan book and seemed to delay recognizing losses. In Allied's case, the Ponzi dynamic was even more acute because it didn't produce enough cash to fund its distribution to shareholders. It had to fund its distributions in part by issuing new stock. As Einhorn continued researching the company, he found evidence that employees at a large Allied subsidiary, Business Loan Express (BLX), were defrauding the government. BLX was a small-business lender that received loan guarantees from the Small Business Administration, and Fooling documents numerous instances of loan fraud that Einhorn and his associates discovered. BLX also delayed recognizing loan losses and didn't produce enough cash to cover the dividends it distributed to Allied, which required Allied to constantly "invest" more capital in BLX, making it something of a microcosm of its parent company. Einhorn presented clear evidence of Allied's and BLX's fraudulent actions to various regulators over several years, and they consistently dragged their feet in investigating the companies. "Another difference from SC is that we avoid 'evolving hypotheses.' If our investment rationale proves false, we exit the position rather than create a new justification to hold." Unfortunately, he didn't take this lesson to heart while fighting Allied. Originally, Einhorn found instances in which Allied contravened SEC regulations by overvaluing bad loans. He thought that publicizing this would cause investors to sell the Allied's stock and regulators to crack down on the company. He soon realized that Allied's stockholders were clueless mutual funds and yield hogs who only cared about the distribution, not the fundamentals, and that regulators couldn't be bothered to do their jobs, but he stayed short thinking that rising loan losses would force Allied to cut the distribution. Then Allied sold a large subsidiary, Hillman, for much more than people thought it was worth, snuffing the argument that losses would lead to a distribution cut, but Einhorn again stayed short. This time he was convinced, despite his past experience with regulators, that fraud would force the government to shut BLX down. Allied collapsed after Fooling was published: the 2008 recession led to an upswelling of bad loans and killed Allied's ability to raise capital. As with Sirrom, it was a financial crisis rather than endogenous problems that ended Allied's Ponzi growth. My sense is that Einhorn was lucky to have shorted Sirrom right before the LTCM crisis hit it, and this luck made him overconfident about how soon Allied would blow up. The first few chapters of Fooling describe Einhorn's early career, before his Allied crusade. When he started his hedge fund, he found it almost impossible to raise money and had initial capital of only $900,000. Off that low base, he achieved ~60% annualized returns during his first two years using the strategies profiled in Joel Greenblatt's You Can Be a Stock Market Genius, and this enabled him to raise a lot more money. Once his fund surpassed $100mm of assets, annualized returns dropped to 20%, and once it passed $1bn they dropped to 12-13%. Einhorn's dollar-weighted returns are a lot lower than his unweighted returns, although they're still good. A lot of Einhorn's success as a hedge-fund manager comes from his being promotional without seeming promotional: he comes across as honest and straightforward, competes successfully in poker tournaments, and has made a few great high-profile calls. He's also been lucky: any fund that starts with less than a million is likely to fold unless it does really well right away. That's not to denigrate Einhorn's skill, because I think he's better than the vast majority of hedge-fund managers, but even great investors sometimes make flawed investments. Fooling Some of the People All of the Time is proof of that. Donville Kent is a fund manager from Canada. They are proponents of the idea that buying high-return companies is the ultimate investing strategy. According to their latest newsletter, "The 'Holy Grail' of equity investors are companies like Home Capital that have as their key attribute the ability to consistently earn an ROE of 20% or better." I don't mean to pick on Donville, because they have a good track record and seem to have a lot of integrity, but I think that Home Capital is a great example of a company where consistently high ROE does not make an investment good. In corporate presentations, Home Capital describes itself as "Canada's leading alternative financial institution" which underwrites "mortgages not meeting lending criteria at traditional financial institutions." In other words, it lends money to subprime and alt-a borrowers. 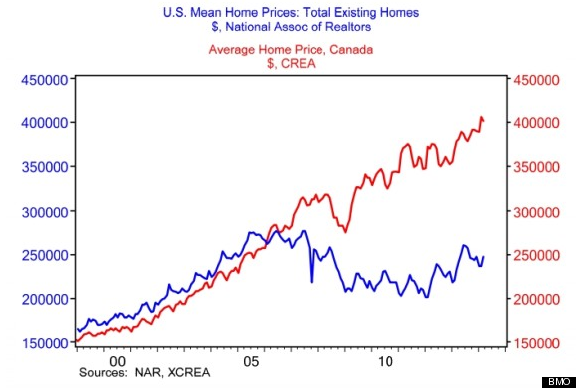 As the chart shows, Canada is in the midst of a truly phenomenal housing bubble. The prudent thing to do in a market like this is to reduce risk by cutting back on lending, which results in lower ROEs in the near term. Home Capital has done the opposite: it has expanded its loan book as the market has gotten frothier, maintaining its ROE by lending against increasingly inflated assets. Golden West Financial was a large savings and loan association in California. Like Home Capital, Golden West consistently earned high ROEs and was a pioneer in introducing new kinds of loans and serving borrowers that larger banks didn't serve very well. Investors and competitors alike admired Golden West. According to Wikipedia, "In 1990 The New York Times called the company 'the Nation's Best-Run S.&L.'" I have an old Peter Lynch book in which he praises Golden West for its entrepreneurial flair and cost-control efforts, much like how Donville praises Home Capital. Wachovia acquired Golden West in 2006. Two years later, Wachovia became one of the biggest casualties of the housing bust, with surging NPLs, and had to sell out to Wells Fargo in a distressed sale. Most of Wachovia's problem loans had originated at Golden West. Golden West had lent aggressively during the housing bubble, and its loan book was so toxic that it nearly destroyed a much larger bank. If the company hadn't been acquired, it would have gone bust pretty quickly. Reassuringly, Donville writes that "Home Capital typically only lends the first 70% of a home’s value. Therefore, if a housing correction were to ensue, the downside risk to Home Capital would be small because the first loss would be absorbed by other lenders or the home owner." Unfortunately, Golden West's lending was pretty similar: "Golden West did not move into the business of making loans with loan-to-value (LTV) ratios of 90%, 100%, or more, which became an accepted practice in the early and mid-2000s. Golden West’s average LTV ratio remained at about 71%." Golden West shows-- and I think Home Capital will soon show-- that earning consistently high returns isn't a good thing for lenders. To the extent that they can earn higher returns by operating more efficiently, that's great. But lending prudently often necessitates sacrificing ROE to maintain asset quality and avoid fatal risks.